Time and time again, small businesses fall into a depressed state of action. Traffic slows, conversion rates go down, sales numbers drop off . . . the results just aren’t there, or perhaps they never were there. Either way, both the small business and the owner fall into a slump, and many times, the owner has no idea what to do to get out of it. Maybe they start a promotion on social media, try their hand at email marketing, or blindly cold call their industry, but nothing is done with the finesse or the focused-energy required to really get them to break through. 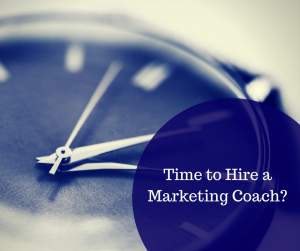 When business slows and you have a hard time even figuring out what to do next when you sit down at your desk, it’s time to hire a marketing coach! Many small business owners are afraid to hire a marketing coach for a couple of reasons, namely that they don’t want their vision of their business to be compromised, or they believe there is some shame in seeking help with coaching. Both of these points couldn’t be further from the truth. A good marketing coach will work with you and your vision for your business to finally bring it to fruition, and there is certainly no shame in learning marketing and general business skills from a professional coach whose job is to teach you! When you hire a marketing coach, you’re bringing aboard a team member who wants to get you the results that you want. After all, that’s what makes them look awesome to others! Marketing coaches will work with you and sort through the strengths and weaknesses of your business as well as those strengths and weaknesses you have as an owner, and come up with a tailored long-term marketing plan that focuses on achievable goals. Some of these goals can include finding the best growth strategies, discovering your ideal customer, strengthening your brand, and setting up a proper and appealing web presence. An experienced marketing coach will be there every step of the way, checking up with you and keeping you on track, taking note of what needs improvement, and what the next steps should be in the short-term. By hiring an experienced marketing coach, you will learn valuable skills and methods that you can apply to your business for the rest of your career, including ways to stay focused and maintain a consistent brand presence. By learning more about what makes a marketing strategy work and having an advocate invested in your success, you are setting yourself up for success! The results will speak for themselves, and that dream you once had of taking your business to the next level will be buzzing in your head again with the newfound belief that it really is achievable! Vision Force has experienced marketing coaches who will work with you whether you’re just starting out, or you’re an experienced entrepreneur who needs a sounding board. All of our marketing coaches are experienced in both strategy and tactical implementation. They will work with you to help you achieve your business goals.